Prior to the start of this Saturday’s HBO Boxing After Dark telecast beginning at 9:45 p.m. ET/PT of the highly anticipated SUPERFLY 3 event, Tom Loeffler’s 360 Promotions will present a live ‘free of charge’ worldwide stream of the sensational five-bout undercard from the “Fabulous” Forum starting at 4:00 p.m. PT. The commentators for the international broadcast will be the ‘Dynamic Duo’ of Steve Kim and Doug Fischer with the undercard fights being streamed at www.360Promotions.us and all 360 Promotions’ Social Media Platforms, (Facebook, 360BoxingPromos and Twitter, 360BoxingPromos , TomLoeffler1). 360 Promotions’ Cynthia Conte will handle the on-site hosting duties on the live stream. Headlining the undercard, undefeated Romanian Alexandru Marin, (16-0-0, 11 KO’s), now based out of Bethesda, MD, will defend his IBF Super Flyweight Inter-Continental Title against popular Filipino contender Bruno Escalante Jr. , (17-3-1, 7 KO’s), of Redwood City, CA in a scheduled 10-round clash. The hard-hitting 26-year-old Marin is coming off the biggest victory of his five years as a professional, a second-round knockout of Michael Ruiz Jr. on April 14, 2018 in Norfolk, Virginia. Prior to turning professional Marin had a very accomplished amateur career compiling a record of 150-10 and winning two national titles in his native Romania. 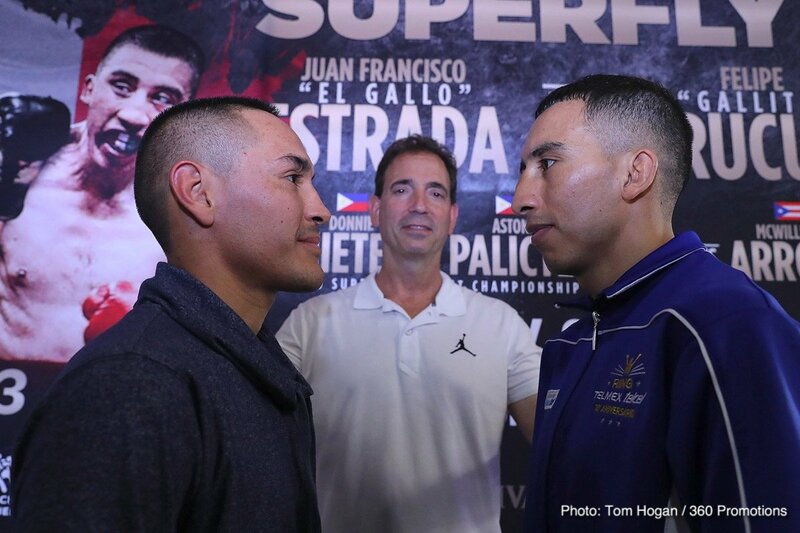 Fighting for the third time in 2018, the 29-year-old Escalante returns to battle following an eight-round decision over Diuhl Olguin on April 14, 2018 in Salinas, CA. In a special attraction ten-round women’s bout ‘Bang Bang Lulu’ Louisa Hawton, (8-1-0, 4 KO’s) of Perth, Australia will face Brenda ‘La Bonita’ Flores, (12-4-1, 2KO’s) of Tijuana, Mexico for the Interim WBC Women’s Atomweight World Title. Now based and training in Los Angeles, Hawton hits the ring again following a four-round stoppage of Elvia Trevino on June 6, 2018 at the second edition of the 360 Promotions’ acclaimed ‘Hollywood Fight Nights’ series at the Avalon in Hollywood, CA. Fighting at SUPERFLY 2 at the Forum on February 24, Hawton came up just short in losing a very close, hotly contested eight-round decision to Anahi Torres. Fighting for the first time in the United States, the 25-year-old Flores heads back into action coming off an eight-round decision over Maria Goreti on March 16, 2018 in Tijuana, Mexico. Prior to the victory, Flores challenged undefeated Silvia Torres for the Interim WBA Junior Flyweight Title, losing a hard-fought ten-round decision on December 16, 2017 in Distrito Federal, Mexico. In a four-round middleweight tilt, undefeated local fan favorite Jonathan ‘Diamante’ Esquivel, (6-0-0, 6 KO’s) of Anaheim, CA faces off against Joan Jose ‘La Sombra’ Valenzuela, (5-9-1, 5 KO’s), of Tijuana, Mexico. Since turning professional in July 2017, the 23-year-old Esquivel has quickly impressed West Coast Boxing fans as a top prospect with his show-stopping knockouts in each of his starts. The battle-tested, 22-year-old Valenzuela has faced numerous top prospects throughout his career including Serhii Bohachuk, Jonathan Navarro and Emmanuel Medina in his last three bouts. Fighting out of San Diego, CA and just 18-years-old, undefeated Mario ‘Matador’ Ramos, (5-0-0, 5 KO’s), will look to keep his knockout streak intact battling cross-town rival Alex ‘Girito’ Solario, (4-3) also of San Diego, CA in a six- round junior lightweight bout. The southpaw Ramos kept his record perfect on June 6, 2018 stopping Guadalupe Arroyo in the sixth round at the Avalon in Hollywood, CA. The 22-year-old Solorio looks to get back in the win column after losing to undefeated prospect Gabriel Flores Jr. on February 3, 2018 in Corpus Christi, TX. Opening the SUPERFLY 3 undercard action at the Forum on September 8, top Mexican flyweight prospect Joselito ‘El Huracan’ Velasquez, (5-0-0, 5 KO’s), of Quintana Roo, Mexico faces off against Tijuana, Mexico’s Jose Alfredo Flores Chanez, (6-6-0, 3 KO’s) in a scheduled six rounder. The hard-hitting Velasquez will be fighting for the first time in Los Angeles following a fifth-round knockout of Armando Vazquez on December 9, 2017 in Las Vegas. The upset minded Chanez looks to bounce back into the win column after dropping a hotly contested four-round decision to undefeated prospect Jose Balderas on July 28, 2018 in Los Angeles. Emanating from the “Fabulous” Forum in Los Angeles on Saturday, September 8 and televised on HBO Boxing After Dark beginning at 9:45 p.m. ET/PT, SUPERFLY 3 is headlined by a 12-round WBC Super Flyweight Final Elimination Bout between former world champion JUAN FRANCISCO ‘El Gallo’ ESTRADA, (36-3-0, 25 KO’s), of Sonora, Mexico and two-time world title challenger FELIPE ‘Gallito’ ORUCUTA, (36-4-0, 30 KO’s), of Nicolas Romero, Mexico. Estrada vs. Orucuta is promoted in association with Zanfer Promotions. Co-featured over 12-rounds for the vacant WBO Super Flyweight World Title, three-division world champion DONNIE ‘The Snake’ NIETES, (41-1-4, 23 KO’s), of Bacolod City, Philippines, moves up one division to face rival countryman and #2 world ranked challenger ‘Mighty’ ASTON PALICTE, (24-2-0, 20 KO’s) of Bago City, Philippines. Advance tickets for SUPERFLY 3, priced at $150, $100, $75, $50 and $25 can be purchased HERE. The Forum is located at 3900 W. Manchester Blvd, Inglewood CA 90305. Doors on the night of the event will open at 4:00 p.m.